2/16/2002; 50º57' south- Campo del Torres. Bus from park administration to Torres trail head, hiked 10km & gained 700m in 3hrs. The trail up to Camp Torres is more of a climbers trail than a hikers trail; it heads straight uphill to the objective rather than bothering with switchbacks. Even though Mandy and I are carrying small packs, we have each managed to cram 55 pounds of food and gear into and around our packs. While others go light and hike from refugio to refugio with day packs and have hot meals and showers each night, we have opted for spending less, carrying more, and smelling worse. After four hours of hiking and tenuous stream crossings we reach Camp Torres and set up the tent. We eat our dinner with a nice guy from England named Patrick who spends 2-4 months a year teaching and the rest of his time hitchiking around the globe. 2/17/2002; 51º01' south- Refugio los Cuernos. Hiked 20km with packs, 4km without, gained 400m & lost 1100m in 8hrs. The stunning granite spires of Torres del Paine are reflected in Laguna Torres against a deep blue sky. We have been blessed with good weather for the past week, and now we sit on a glacial moraine opposite the Torres and gaze at the magnificent towers. It was a short but steep hike up to the towers, and it was well worth packing in to Camp Torres the evening before in order to arrive at the Torres overlook early in the morning with just a few other hikers. After hiking about for different views and just sitting in awe for a while we return to camp, pack up, and head toward camp Italiano. 15km later we reach a swift and deep glacial stream with no obvious crossing. What started as a minor pain in my knees a few hours ago has gotten much worse, and I stop to soak them in the cold water while Mandy looks for the best way across. I am ready to go after a couple of advil, an ace bandage, and a lot of milk chocolate. Once one opens a melted chocolate bar, it is best not to stop eating until it is finished! We take off our shoes and cautiously wade across the stream, and then I limp and Mandy hikes for another 2 hours to refugio Los Cuernos where I gladly pay the $5/person camping fee which includes hot showers. 2/18/2002; 51º01' south- Campo Italiano. Hiked 8km with packs, 16km without, gained 800m & lost 600m in 8 hrs. My knees are feeling better but have not fully recovered, and so after breakfast and packing we hike for just two hours to camp Italiano and pitch the tent. The spectacular east face of Paine Grande looms just to the west of camp with glaciers hanging over and tumbling down 1000m of steep rock walls. My scant knowledge of the Nordwand comes from the Clint Eastwood movie "The Eiger Sanction", but this face of Paine Grande must be more impressive. Ever now and again pieces of hanging glacier break off and thunder down the cliffs in an impressive avalanche. The skies were overcast most of the morning, and now a light rain begins. Despite the rain we pack for a day hike up Valley Frances, and soon we are climbing steeply through forests of Lenga with the walls of Paine Grande to our west , and the Cuernos de Paine to our east. 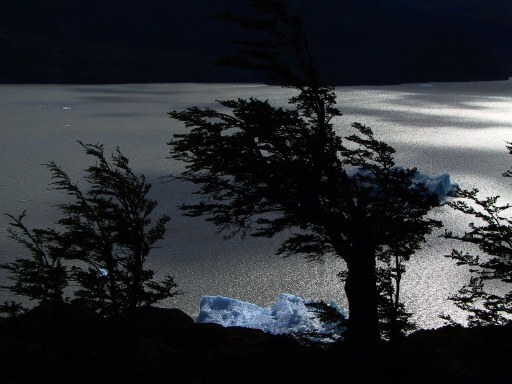 This is the first time that I have taken notice of the trees, and I am enchanted by the broad, flat canopy of the leaves silhouetted against the glaciers and rock walls. 2/19/2002; 51º south- Refugio Grey. Hiked 30km with packs, gained 300m & lost 400m in 8hrs. Another morning with clouds and light rain. We pack a damp tent and hike down to refugio Pehoe. 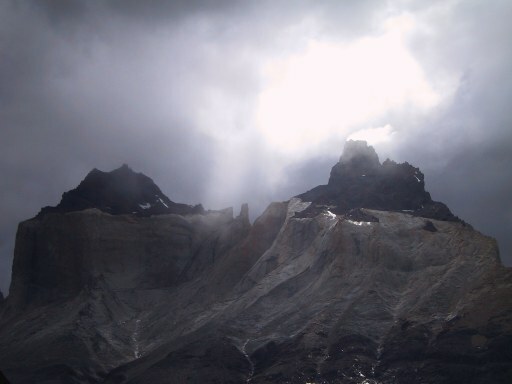 Looking over our shoulder as we hike we see shafts of sunlight pierce brief holes in the clouds, illuminating the Cuernos. After a nice rest at the shores of lago Pehoe we star up the trail to refugio Grey, another 5 hours away. The weather has been clearing all day, and as we approach lago Grey the wind starts to pick up. After passing a classic windswept patagonian tree beside the trail we turn a corner and Mandy exclaims "Holy Cow"! In front of us the vast glacier Grey sweeps down off of the southern ice cap through the Andes and empties into lago Grey. It is really amazing. Despite the ferocious wind at this overlook we stop to take photos. Mandy also spots several condors soaring near the western slopes of Paine Grande. Wow. The trail drops steeply down from the overlook, and another two hours of pleasant hiking and spectacular scenery brings us to our camp at refugio Grey. 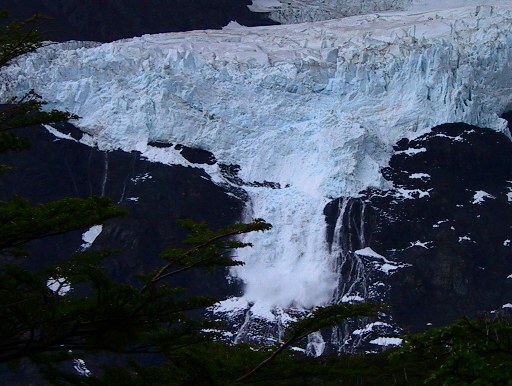 Along the way I stop to photograph icebergs on lago Grey, waterfalls, flowers and condors. Mandy went ahead to camp, and when I arrive she is lounging on the grey sand beach in front of camp. A small block of ice has beached here, and campers are chipping pieces off for pisco sours. 2/20/2002; 51º south- Refugio Grey. Hiked 8km without packs, gained & lost 500m in 5hrs. 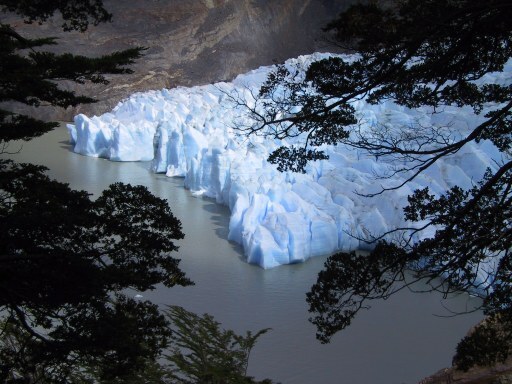 We sit in silence at the overlook and gaze at the wall of ice ending in lago Grey. Beyond the terminus a jumble of blue and white seracs march for miles and miles up the ice filled valley, originating in the southern ice cap. 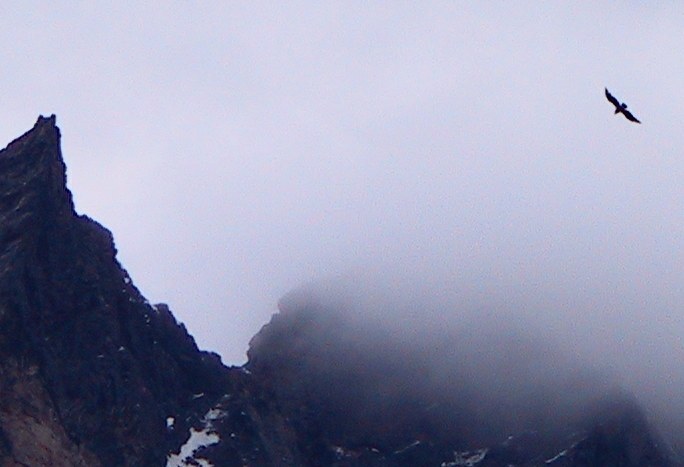 Grey clouds brood over the ice cap, dropping snow and building the glacier flake by flake. In geologic time, the glacier moves as swift as the wind, tearing down the mountains as it goes. But my puny human mind cannot comprehend how long it has been since the flakes fell that formed the blue ice at the base of the wall in front of us. 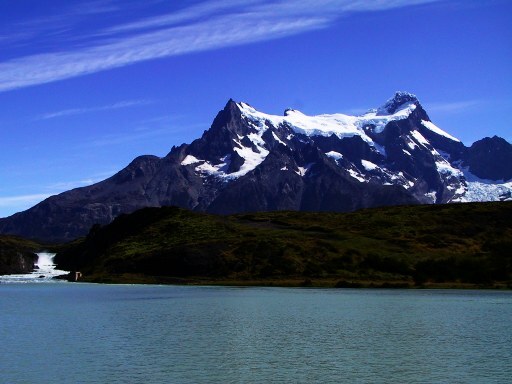 2/21/2002; 51º11' south- Torres del Paine Administration. Hiked 20km with packs, gained and lost 300m in 3.5hrs. We wake early and are on the trail by 7 and back to Pehoe by 10:30, just missing the 10:00 ferry. So we wait for the 12:30 ferry across lago Pehoe, and our patience is rewarded with magnificent vistas of the cordillera Paine on the half hour trip across the lake. All of the busses are headed out of the park at this time of day, so we bum a ride with a park ranger back to the administration building where we re-pack the bikes and start our journey to El Calafate, Argentina. Paine Grande with Saltos Grande & Lago Pehoe in the foreground.